We move to the older horses this week, possibly sniffing out some horses for the Pacific Classic, Breeders’ Cup Classic or the Mile. The race is 8.5f on the dirt. While the race is still quite compelling, news came that last year’s champion, Accelerate, who this year has won the Santa Anita Handicap as well as the Gold Cup, had scratched. The scratch of Curlin Rules hurts to a lesser extent, who would have to be on his game and on the improve to win here. We have a field of 6 with several horses having run 100 plus speed figures in their careers. The race begins for me with Dr. Dorr who cuts back in distance after tiring badly in the Suburban. He did not run well over the Del Mar surface last year and one has to wonder whether he’ll take it the track today. He made the first two starts of his career at Del Mar. 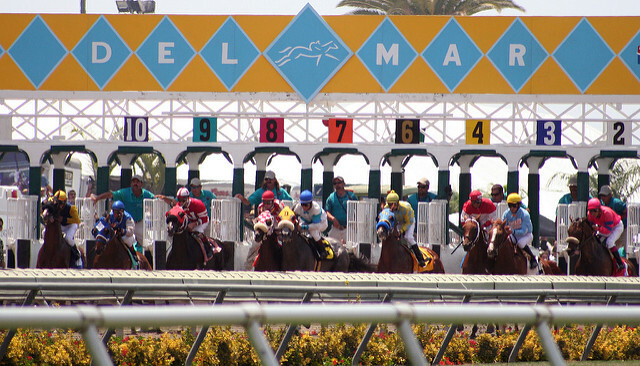 Baffert’s horses are usually ready to run, but he also perhaps just wasn’t ready. He didn’t blossom until after leaving San Diego, initially over the turf in New York. His dirt speed had a breakthrough on his return to the races in March, topping out with a win in the G2 Californian, the primary prep for the Gold Cup. There’s a chance that the Suburban was him coming off form or it could just be a one-off bad performance due to the track. On his game, he’s the most consistent and fastest — it’s just a question of how you evaluate the uncertainty. Dabster will be going the farthest distance of his career. He’s already won twice at a mile (and once at 7f) in 6-lifetime starts. How he reacts to the extra half furlong will determine whether he can find the winner’s circle. He’s a bit slow to win the race if he doesn’t improve, whether due to likely the distance or other factors. Harlan Punch ships in from the East Coast where he recently won by 5 1/4 lengths G3. That race was run at today’s distance. He’s never run at Del Mar before. He’s run some high Beyer Speed figure several times in his career, including a 97 last time out. Catalina Cruiser is undefeated in 2 starts and put up an impressive 107 Beyer Speed Figure in 6f sprint last May. His pedigree suggests distance so the stretchout is not out of the question. If he can repeat that number routing, he’s in the winner’s circle. At 8-1 on the morning line, he seems like a good dark horse bet. Two Thirty Five has had a nice run of improvement since breaking his maiden for 20K in November of 2017 (over this surface.) He’s really put it together for trainer Richard Baltas, but he’ll face a class test today. He won an N2X by 4 1/4 lengths last out in a field of 5. This race seems a bit tough for El Huerfano, who recently came in 4th — beaten 6 lengths — in the G2 San Carlos. He a bit too slow for today’s race, even on his best. It’s a return to routing, which should help. The result for him last year in this race wasn’t good; he was beaten 35 lengths. Analysis: I would not be shocked to see Dr. Dorr in the winner’s circle. It’s easy to forgive the Surbuban. But I think there’s more upside to Catalina Cruiser on the stretchout and that’s my selection for the race. His two races are very nice and Union Rags/Mineshaft suggests the distance won’t be a problem.